Becoming a personal trainer is the easy part for most newly certified personal trainers, making a living can be much more difficult. AFI shares six simple rules for earning a healthy living as a certified personal trainer. Read on. Becoming a Certified Personal Trainer is the easy part for most newly Certified Personal Trainers, making a living as a trainer can be much more difficult. AFI will share with you six simple rules for earning a healthy living as a Certified Personal Trainer. First, ask yourself this question: If two Trainers both earning $50,000.00 a year, one who works forty hours a week, and the other works ten hours a week, at the end of the year which trainer is richer? Since both trainers earn the same amount of money, the question has less to do about money, and more about the freedom mentality of personal trainers. The person working forty hours a week is earning around $20.00 an hour, the one working ten hours a week is earning $100.00 an hour, they both earn the same $50,000.00 at the end of the year. I would argue that the person working only ten hours is much, much richer. An extra 30 hours a week to spend with friends and family or building your business is absolutely priceless. Time is why the ten-hour a week person is richer; they have the luxury of time. So how do we turn each and every one of you into the ten-hour a week $50,000.00 a year trainer, or even the 20 hour a week $100,000.00 a year trainer? It is a lot easier than you think and it is actually quite easy if you follow a few simple rules. [ Click To Join The Thread. ] Becoming A Personal Trainer I was hoping to become one soon but I'm not really sure on any of the specifics, as in the tons of organizations, where their recognized, how employment works, how to actualy get the license. These rules apply both to Independent and In-house Trainers in the clubs. Independent Trainers have more freedom in general, including with pricing, and In-house Trainers can earn a healthy living working inside of a health club. There is a lot less risk involved in going to work in one spot, and working for a club as a trainer is still filled with a lot of freedom, especially when you compare it to most other careers out there. In-house trainers can still follow the same simple rules and make the most they possibly can inside the club with the least amount of effort. Has a manager, a coach or a teacher ever asked you to give 110%? I hear it all the time, and it is ridiculous, you can only ever give 100% of your effort. This brings me to the Pareto principal, which is more commonly known as the 80/20 rule. The Pareto Principle is that 20% of your effort is responsible for 80% of your return. Meaning 20 percent of your work brings you 80 percent of your money. Don't believe it? Well the 80/20 rule is an average that applies to just about everything, e.g. 20% of your floor get 80% of the foot traffic, 20% of the world population holds 80% of the worlds wealth, 20% of the drivers cause 80% of traffic accidents. It goes on and on. So when trying to build your business, that means that that don't try to put 100% of your effort into it, just your best 20%. Why? Because your 100% has a whole lot of unproductiveness mixed in with it. When prospecting, focus the best of your efforts, 20% is an average, so you can begin by focusing 10% of your efforts on building new business. Set up a time to be productive, put it in your schedule as an appointment so you will be sure to get done. [ Click here to learn more. ] Training Psychology! Motivation to train is a funny thing, it's either stimulated internally or externally. In this article I will talk about types of clients and the myth of ‘No Pain, No Gain’. Write it in your book and treat it like a paid appointment that cannot be moved or cancelled. 10% of 60 minutes is only 6 minutes. For 6 minutes, hit the gym floor and focus on setting appointments. Six minutes is the minimum, if you can do more effectively, do more. There are 40 hours in a traditional workweek, begin by scheduling 10% for building your business, which is only four hours a week. For those four-hours, you must force yourself to be productive. For an average of only 6 minutes an hour, you need to be focused on the single-minded task of growing your business. 6 minutes of focused effort can equal $100 an hour, twice a week totaling an additional $10,400.00 a year. That means that at least once every hour while in the gym you spend 10% of the time laser focused on setting appointments for first workouts, ignoring all distractions. 10% is the minimum; if you can do 20% stay out there for 12 minutes, but then take a break. Outside of the gym, force yourself to strike up a conversation with a stranger, break out of your comfort zone and spend ALL of your prospecting time speaking to people you do not know. Follow the 80/20 rule, give your best and then recharge so that you can do it again. Below are a few simple rules to follow while giving your best 20% that will help you build your business in the shortest amount of time possible. They are effective both inside and outside of a health club setting. When prospecting, you are looking for only the best prospects that are interested in buying what you have to offer right now, even if all you are selling is an appointment for a complimentary first workout. [ Click here to learn more. ] Marketing Tips For Trainers! Marketing tips for trainers. Learn more from 8 descriptive ideas to improve your marketing and how you are perceived by clients! If you prospect the floor with the composure of "I am just here to help" and "I am not looking for new clients", people will want to train with you, they will be drawn to you as a trainer. That eliminates the need for a free first workout, now you can charge for a first workout. The assumption most people will make is that a busy trainer is a good trainer, and people often want what they cannot have. As a trainer, I followed these rules to pick up clients quickly, but when I was managing health clubs, it was always a lot easier to set first workouts for the trainers I managed. Approach prospects and always set an appointment for "one of your trainers." After they agree, let them know that you will train them yourself since you are interested in seeing them reach their goal. To See Them Reach Their Goal. I have found this to be one of the easiest and best ways to set first workouts. Casually walk up to a prospect, build rapport and then simply offer to set the prospect up with a complimentary one on one personal training session with one of your teammates. If they say no, it is not to you but to your offer. There is absolutely no tension involved on either side of the interaction, no pressure at all. Prospecting in tandem is only effective if both trainers are equally motivated and equally gregarious. Target prospects that you have spoken with, but not pitched, the friendly people you feel awkward pitching. Simply walk up to prospective clients together and then one trainer endorses the trainer who is "up." It is as simple as saying you have to try and work out with this guy/girl he/she is amazing and perfect for you, you will definitely love it. [ Click here to learn more. ] Selling Personal Training! Personal Training is often purchased to satisfy a need for change. Your job is to find out exactly what those needs are. That is called a 3rd party endorsement and if you are endorsing yourself, you just sound like an idiot, so try and find an outgoing trainer who also wants to grow their business and take turns. It is amazing how much harder a trainer will try to get an appointment for another trainer, usually much harder than they would for themselves. Effective Way To Gain Prospects. The way the "up" system works is a trainer is up until an appointment is made, then alternate. everywhere. A trainer shirt is a conversation starter, and works in a much more naturally way than walking up to strangers and saying, "Hey, I am a trainer." 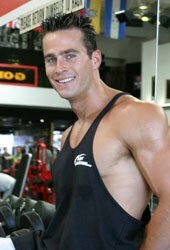 Bodybuilding.com is your source for great fitness styles that will help show off your hard work. Everything is high quality, but we priced them low since you are buying them direct! People ask some really silly questions, so let people see your trainer shirt and ask you if you are a trainer. Then follow the golden AFI Rules of what to do when asked that or any other question. Let People See That You Are A Trainer. Supermarkets, Starbucks, book stores, you name it, people will constantly ask me about fitness whenever I am wearing a Bodybuilding.com trainer shirt, and I always ask them a question to gauge their interest and goals. Then I offer to set them up with a graduate trainer; it is that simple. So wear the shirt and set appointments. Posting that you are a trainer taking on clients or that you are the world's best trainer is borderline ridiculous. You cannot stand out on craigslist by tooting your own horn. People searching for a personal trainer online look at your ad, then the next and forget you both exist. Putting an ad out that way and hoping that your ad is the best or that someone will call you is the worst possible way to use that media to make money. Have You Ever Used Craigslist To Get Clients? You can change this by offering a little free information like the ten mistakes you do not want to make when choosing a trainer. Offer the list only to people who e-mail you for it, then you have their e-mail and more importantly their interest instead of hoping for the best, most importantly you will have a targeted e-mail list of prospects. You may already know that this is the fastest way to get new clients, but may not be effective at it. The best way to get client referrals is to simply ask your existing clients for referrals. You do not have to offer them anything if they are happy with you, they will be more than happy to help. Do not offer free anything in exchange for referrals from your clients. Offering free sessions for referrals has been known to be effective, but in my experience it is completely unnecessary and devalues your services. [ Click here to learn more. ] Trainer Of The Month! Lance was chosen as the Personal Trainer of the Month because of his dedication to improving the lives of as many people as possible! A quick way to getting referrals from clients is by giving referrals, so if you ask your clients for a large stack of their business cards and let them know you will be looking out for potential new clients, business and money for them, chances are they will do the same for you with out you having to ask them. Of course if they do not ask for your cards in return, offer them a few. The number one rule is being unavailable; "I am not taking on anymore clients," is something you want to let new prospects know when you are discussing training. It sends a message that your time is valuable; let them know you are still interested in setting them up with a trainer to help them reach their goals. Then choose to train them yourself or to grow your business by hiring another trainer to hire them. By focusing your efforts for an average 6-12 minutes per hour and follow these six simple prospecting rules and you can easily become a Personal Trainer who works ten-twenty hours a week, $50-$100,000 a year trainer. It is easier than you think and you can do it by focusing the best 20% of your efforts. AFI is here at Bodybuilding.com to help you with your personal training needs.